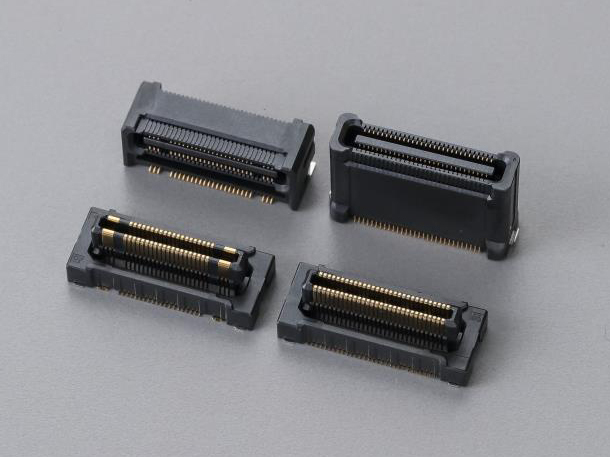 Kyocera Corporation (President: Hideo Tanimoto) today announced its new 5656 Series electronic Board-to-Board connectors, featuring 0.5mm pitch and a proprietary floating structure that delivers the world's highest mating tolerance*1 with heat resistance up to +125°C. The new connectors appropriate for use in car navigation systems, in-vehicle infotainment and millimeter wave radar, are now available to support manufacturers worldwide. Advancements in automotive infotainment and driver-assist technologies are creating new demand for electronic connectors that meet two key requirements. First, they must operate reliably amid high temperatures; and second, they must maintain stable contact position against vibration and shock. Kyocera's new 0.5mm-pitch Board-to-Board connectors are specifically designed for these requirements, with heat resistance up to +125°C and a proprietary floating mechanism that provides mating tolerance of ±1.0mm (F/P*2=200%) in both the X and Y directions — 2.2 times larger than Kyocera's conventional connector products. This enhanced mating tolerance ensures reliable connections by compensating for a greater degree of location mating error and mounting slippage during assembly, as well as vibration and shock in the operating environment. Kyocera continues to expand its automotive electronic connector line with new products offering enhanced features and performance. By providing new solutions for emerging requirements, the company aims to contribute to the advancement of the industry. Kyocera's proprietary floating structure ensures reliable connections in the mated state even amid movement of up to ±1.0mm (F/P=200%) in both the X and Y directions. Kyocera's new 5656 Series connectors feature an operating temperature range of -40°C to +125°C, facilitating use in car navigation system, in-vehicle infotainment and millimeter wave radar. The form of the area (terminals) removes foreign materials by wiping ensuring reliable connections. The structure enables users to inspect the tail area to mount a board visually from above or by using an optical inspection device thus enhancing operation efficiency. *other variations may be available later D.W. voltage AC 250Vrms/min. *1 Based on Kyocera's research of this class of connector (as of April 30, 2018).